A Joint Development Project (JDP) hatched in Europe aims to bring Liquefied Natural Gas (LNG) -fuelled vessels into shipping’s mainstream. 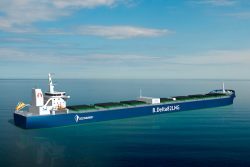 Industry leaders Arista Shipping, Deltamarin, GTT and Wärtsilä have been joined by American Bureau of Shipping (ABS) in “Project Forward” to develop a dry bulk carrier concept that employs LNG as fuel. The goal is to develop a Kamsarmax bulk carrier design to be the first of this type suitable for worldwide services powered by LNG in compliance with the International Maritime Organization (IMO)’s Energy Efficiency Design Index 2025 standards, NOx Tier III and Marpol Annex VI SOx emission levels. This landmark design will be the first LNG-fueled cargo ship capable of full-range operations. A Kamsarmax type bulk carrier in essence is a modern, single-deck carrier of 82,000 dwt, 32.25 m beam, 229 m overall length (LOA) vessel of maximum size able to berth at Port Kamsar in Equatorial Guinea. Technical challenges in developing this design were considerable, as there is a need to carry a large volume of LNG (2,500 cu. m.) – which corresponds to full-range operation and 40 days – in a type of ship where available space is limited and cargo space is at a premium. International classification society ABS will provide Approval in Principle (AiP) for the concept, which is based on the highly optimized Deltamarin B.Delta 82 design, utilizing a GTT membrane LNG fuel tank. This design also could be applied to other bulk carrier sizes and serve as the basis for an LNG-fueled tanker. The concept features a Wärtsilä four-stroke, medium-speed engine without auxiliary generators, the first time this configuration has been applied to a vessel of this type, significantly simplifying the vessel’s engine room arrangement and contributing to lower capital expenditure.